﻿ Miter Return Stair Treads | Scotia Stairs Ltd.
Scotia Stairs Limited stocks and custom manufactures a wide selection of Miter Return Stair Treads in many hardwood types. We can install a miter return on the left hand or right hand side of hardwood stair treads for a single return, or on both sides for a double return. 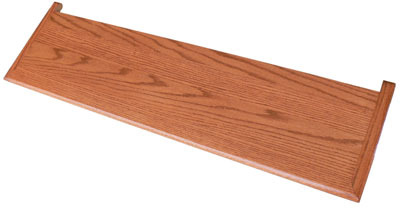 >>> For information on sizing for single miter return hardwood stair treads click here the “+” sign below, next to Single Miter Return Stairs ( Left Miter -or- Right Miter ). 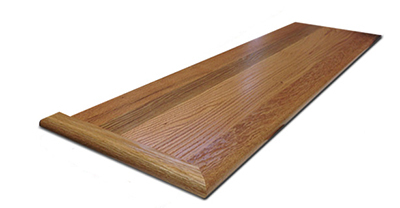 We custom manufacture double miter return stair treads using many hardwood types. For double miter returns we install both left hand and right side miter returns on the same hardwood stair tread. Let us know your required size and we can custom size the treads to fit your specific stairs case needs. >>> For information on sizing for double miter return hardwood stair treads click here the “+” sign below, next to Double Miter Return Stair Treads ( Left Miter Installed -&- Right Miter Installed ). Scotia Stairs sales professionals recommend that you read through our DIY pages before starting your stair project, and review our information below relating to single and double miter stair treads. This important information on sizing, how a miter return is installed, and how to properly tell which side is mitered on a single miter stair tread ( as well as how our product codes work ) will help you plan and order the correct products.